After a long wait, and even some frustration, a new MorphOS was finally released in summer 2008. It took over 3 years since the previous 1.4.5 release, albeit there were some smaller updates and possibility to try some of the new components in their beta state. Because of major changes in all areas, the version was promoted from the originally declared 1.5 to 2.0. At the same time MorphOS also became a commercial product. Development of MorphOS, as a successor to the AmigaOS for the PPC platform, was started in the late 90s. At that time there weren't any signs of an official continuation or moving away from the 68k platform for the AmigaOS. It was important to have good compatibility with existing 68k and PPC Amiga programs and MorphOS achieved that in the early stage. The first versions worked only on Amiga computers equipped with phase5's PPC accelerators, but an actual breakthrough happened later with Pegasos computers. Version 2.0 added support for the small and cheap Efika, while continuation of the Amiga support became uncertain. From version 2.4 MorphOS also works on Mac mini G4 computers and with next versions on 1.25GHz eMac and on almost all PowerMac G4 models which have supported graphics card. 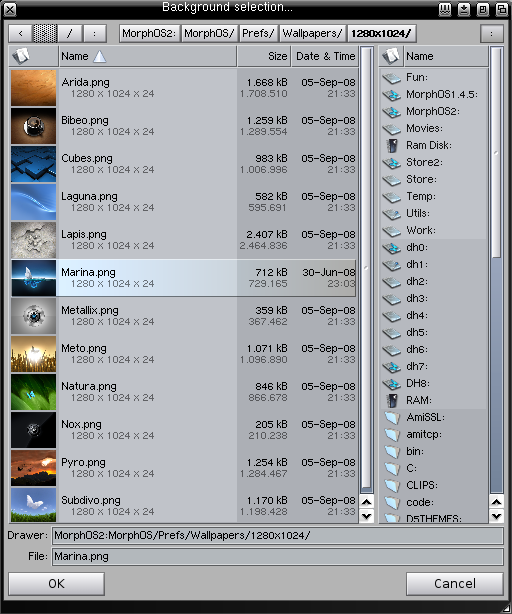 MorphOS 2 has been renewed on almost all areas when compared to the earlier versions. The most visible improvements are for example a new version of Magic User Interface (MUI4), a greatly improved Ambient desktop, a possibility to use 3D accelerated layers to draw the OS windows, a completely new version of the Poseidon USB stack, a reworked system preferences program, a new integrated TCP/IP stack, an easy graphical installation process, screenbar modules, Reggae framework for multimedia streams and many new utilities. Not to talk about a polished feeling of the appearance and extra stuff like wallpapers, blankers etc. The whole package is pretty complete now and there isn't need for gathering all the 3rd party programs like it used to be with the earlier versions. You can find countless amount of new things under the hood and many components have been rewritten. There's AltiVec support for G4 processors, better filesystem support, a new memory system and many new shell commands. Hardware support has been improved with support from a gigabit ethernet to USB2 controllers as well as to keyboards containing special multimedia keys etc. 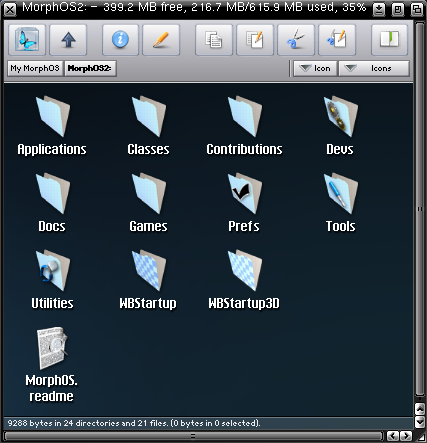 The basic principle is that you can install a fully working MorphOS on your computer for free, but without registration it is time limited. The unregistered installation slows down to an almost unusable state after about half an hour and you'll have to reboot to get it usable again. This way you can test that the OS will work on your computer before you pay for it. If you want to register it, you just run RegTool program from the Tools directory. The computer has to be connected to the internet when you do it. RegTool asks some questions and gives you payment instructions. After the payment you get a personal keyfile in the e-mail and copying it to the Devs directory unlocks the OS. The automatic payment is currently available only through PayPal, but if you don't have an PayPal account, you can ask someone else to make the payment, it doesn't have to be the same person who's registering. Other payment methods can be negotiated separately. To install or update the MorphOS you have to boot your computer from an installation media. On the Pegasos or Mac from a CD and on the Efika from USB mass storage. 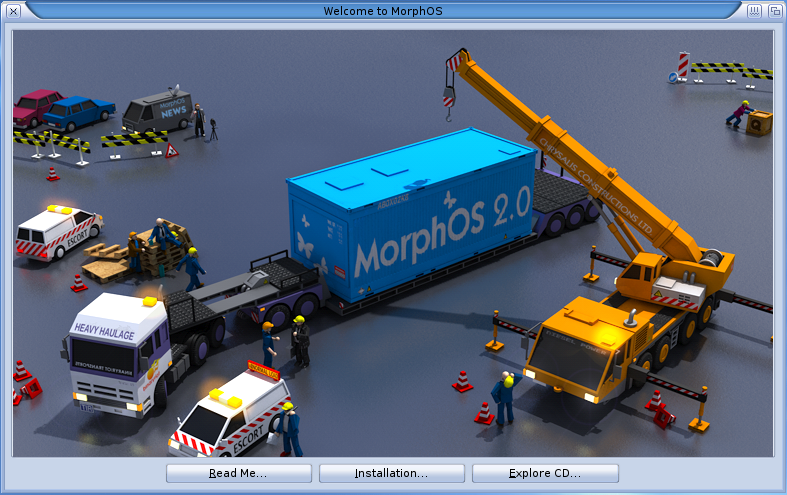 Image files for the installation are freely downloadable from MorphOS Team's web page. The install CD works as a live-CD too. After a boot from the install media you are greeted with a good-looking welcome window (Pic 1). For the first time ever an Amiga compatible operating system also opens directly to the monitor's native resolution by using the DDC. You are presented with options to read more about MorphOS, to install it on a HD with IWizard program or to continue using the system from the install media. The installation program is polished and looks elegant. You get basic settings defined with few steps without going too detailed at this point. You'll already notice a couple of the new features compared to the earlier MorphOS versions. Like PNG mouse pointers, which can have 15 different states instead of original two (Pic 2). Old SCSIConfig has been replaced by a new HDConfig program as the default partitioning tool. And of course the new network settings (Pic 3). Finally you just select a destination partition for installing. Much better than it used to be. MorphOS accepts some new boot options from OpenFirmware. BootMenu option stops the booting at an early stage and gives you a screen which is very similar to the Amiga's Early Startup Control menu. With it you can select different boot partitions, resolutions etc. You can also start the system without executing the startup-sequence, if you want to fix something without loading the full system for example. Bootmenu can be activated by pressing the F1 key or left mouse button during the normal boot too. The layers library has been rewritten completely and it makes possible to draw intuition graphics by using the graphic card's 3D acceleration functions. It makes window moving more solid and gives a possibility to use opacity and shadowing effects. There are already some 3rd party commodities using these new functions. You can get neat 3D effects for screen switching, screen zooming and altering window transparencies (Video 1). Each MUI screen can be configured separately to use the new 3D accelerated layers or traditional 2D rendered layers. For the careless use of the 3D layers you usually need at least 64 megabytes of graphics memory, but it really depends of your usage patterns and a need for separate screens. The system preferences program has got a whole new look. It opens in a new "Panel view" mode, where all the settings are grouped cleanly into their own categories (Pic 4). I find it much easier to find a correct setting now compared to the earlier "List view" mode, where all settings were mixed up in one list. Not to talk about the old Amiga's way of having separate programs in a messy drawer. Anyway, the "List view" is still optional for those who like it more. Old versions of MorphOS were a bit problematic to get usable at first, because there wasn't any TCP/IP stack or FAT filesystem support by default. The most users had to use a CD to transfer critical external components to the system. Those problems are completely gone now. The new integrated NetStack TCP/IP stack works reliably and faster than any older option. System mounts attached FAT formatted USB mass storage devices and internal harddisks automatically with a new native FAT filesystem. As mentioned, mouse pointers have 15 different modes now. Pointers can look different if you are doing something with the mouse or if you can move or resize a window, click a link, etc. Pointer images are actually separate PNG pictures for each state, which makes them easily customizable and they can also be very colorful and have transparency and shadowing effects. 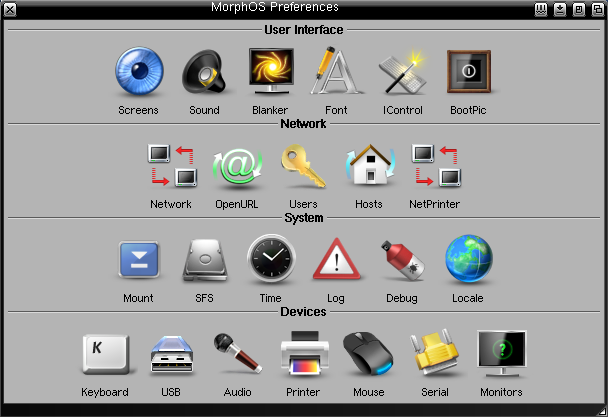 MorphOS offers 8 different pointer themes by default. The appearance in general feels very polished. You can change the whole look of the system with new improved skins (Video 2) and each screen can have its own skin defined. There are also about 30 different screen blankers from traditional 2D blankers to demoscenish 3D blankers (Video 3). You can also modify the behaviour of the startup screen when MorphOS loads. Its graphics and information texts are changeable, with a couple of premade themes offered. As a finishing touch there are lots of good looking wallpapers. Among the most interesting features are the screen titlebar modules (Pic 5). Titlebars have been bit of waste of space traditionally, but now you can populate them with all kinds of more or less useful modules. You can put there information about used memory, CPU load, network traffic, currently playing audio file, date and time. Modules can also be functional like containing a volume control slider, an eject menu or a debug menu. User can freely select which modules are shown and arrange their order. You can also add new 3rd party modules by copying them to SYS:Classes/Screenbar directory. And that's not all, the screenbar modules are visible on every MUI screen! You can see all the information when you are, for example, on a browser's own screen. No need to switch back to the Ambient screen anymore (Video 4). Shell uses MUICON by default now and it gives more features and configuration options (Pic 6). There's a button bar at the top of the shell window and buttons can be modified according to the user's preferences. Keyboard shortcuts are also user defineable and things like automatic name completion have many options for customization. Several different terminal emulations are supported, which makes for example SSH work much better than earlier. With a search function you can find text strings from the visible area as well as from the back buffer. Shell works as tabbed, so you can add new pages, but also detach them as separate windows. You can save sessions and restore them next time. A saved session will contain the current directory, variables, paths and the command history for example. 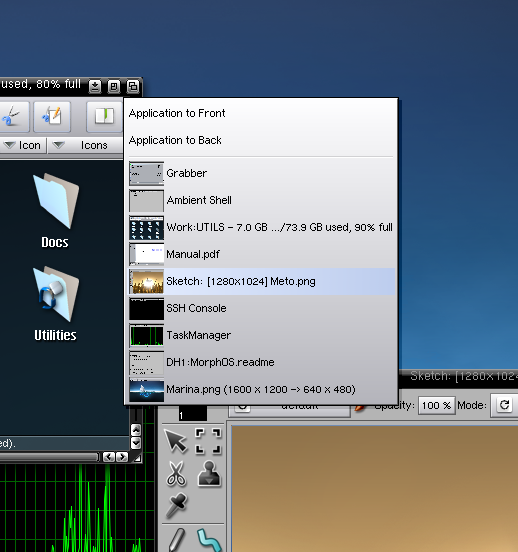 Ambient is the desktop of MorphOS, like Workbench is on the Amiga. It's fully MUI-based and has become much more advanced and versatile than Workbench. Lots of file management features have been copied from Directory Opus 5, which makes external filemanagers needless for the most. Ambient windows are very configurable (Video 5). They can be used as plain and simple like on the Amiga, but they also can work in a browser mode, where you can have custom toolbars with functions for the filemanagement, filesystem navigating etc (Pic 7). One nice example for the toolbar is the "Bookmarks" button, which gives you the option to open any predefined location into the current window with a single selection. In the browser mode you can see the whole directory path for the current location as separate buttons for each level. You can then click anywhere in the path to change the directory by several levels at once. It also remembers the path already visited, so you can jump deeper too. Windows also have a configurable status bar, which gives information about selected items and directory contents. The appearance can be modified quite extensively with MUI settings. Files can be viewed traditionally in the icon view or in the list view, but as a new feature there's a thumbnail mode for both views. You can see preview images of the pictures etc instead of the standard icons. With a realtime scaling you can resize them on the fly too. You can zoom the icons with the control key and mouse wheel in the icon view, for example. Clicking the right mouse button over an icon opens a contextual menu, which contains some common actions for the file handling, like copy and paste functions familiar from other non-amiga operating systems (Pic 8). The menu contains different actions for different filetypes and those can be modified and added freely by your own taste. The list view consists of several columns, which can be arranged as the user wishes. You can select which columns are shown and in which order. You can also select which column is used to sort the items in a view. All selections can be saved for each directory separately. At the moment there are 12 different fields you can select from. Besides the normal size and date, you can add columns for example for filetype, file comment, version number and MD5 hash. The list view offers a nice option for file renaming. You can edit file names directly by clicking them with the mouse wheel and while you are in the editing mode, you can use up and down arrow keys to jump around to other files and edit their names too (Pic 9). Same method works also for file comment fields. A separate rename option from the context menu or the toolbar is good for batch renaming, because you can use wildcards with it. It's easy to rename for example 50 files with .pic extension as .iff files at once. 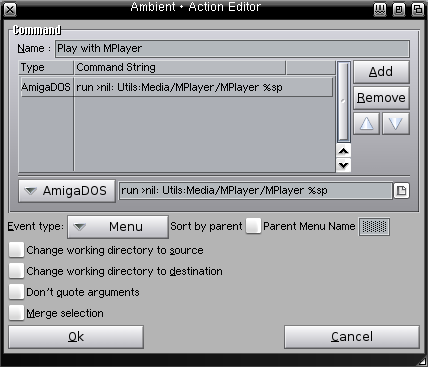 Ambient has got a new "My MorphOS" directory and you can open any volume or assign with it (Pic 10). It works like a root directory and thus extends Amiga's traditional directory structure a bit. You can open it from a icon on the desktop, from the Ambient pulldown menu or optionally by double clicking any empty space on the desktop. Ambient windows can also contain a "Device list" button for it. Ambient uses PNG icons by default, but other formats are supported too. 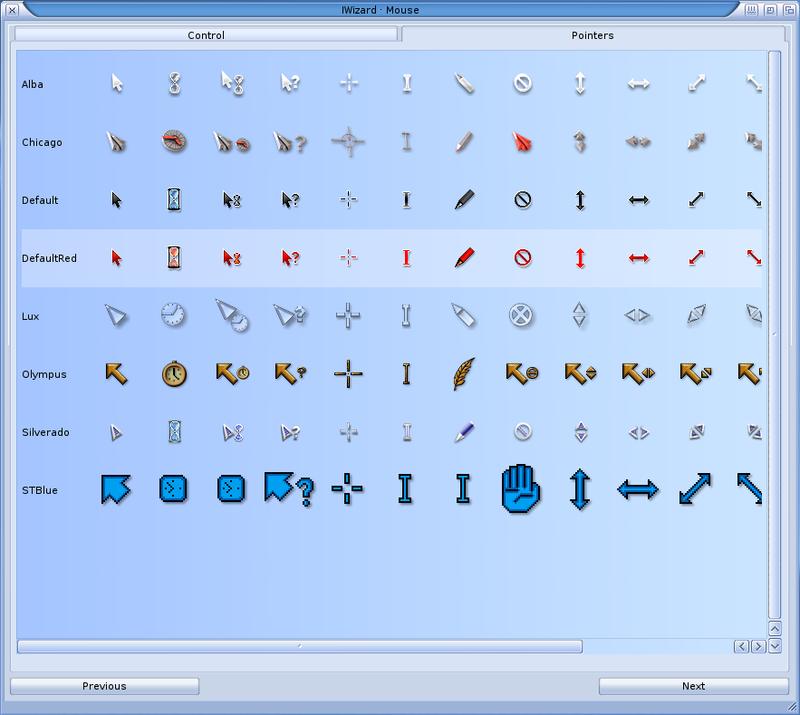 For example old GlowIcons and NewIcons formats from the Amiga will work, as well as newer dual-state PNG icons. Ambient also has built-in viewers for text, image and audio files. The viewers have basic functionality like search for the text and scaling, rotating and browsing the directory for the images. Virtual filesystem support makes possible to browse all kinds of archives and disk images like normal directories. You can open and copy files from the ISO images without burning them first for example. Panels have got some new elements like bookmarks and a view watcher to help navigating between different views. Otherwise the panels still work as basic program launchers. 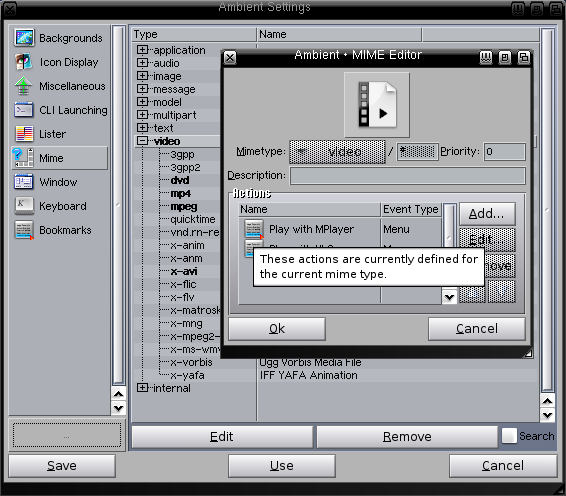 One of the most important new things for the Ambient is a mime editor, which is used to modify the handling of the different filetypes (Pic 11). You can define what will happen when you double click, drag & drop or select some other action from the context menu for a certain file. Each action can contain several commands, which will be executed when the action is performed. Commands can be Ambient's internal commands, AmigaDOS commands or different types of scripts (Pic 12). You can also provide them with arguments like the respective filename etc. Practically anything you ever want to happen when you click a certain type of file is possible to do with it. Mime types are organized hierarchially and higher level definitions are inherited to the lower levels. This way you can make some common options for example for all video files, but then each separate format can also have their own options. You can also define some common options for all directories, devices and files. Each filetype or group can have their own default icons. It's possible to make own default icons for each device too, then you can have different icons for the CD drives, USB and Samba mounts etc. A new shell command "Open" utilizes Ambient's mimetypes too. You can open files by the mime editor's definitions from the shell. For example, "open test.avi" plays the video and you don't have to know which player or options are needed from the shell. It also opens directory paths into the Ambient windows, web addresses into the browser etc. 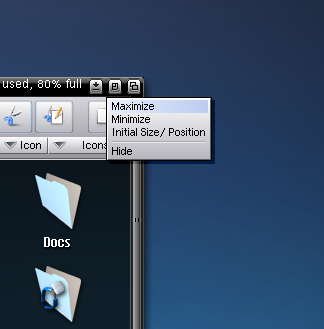 MUI has been the integrated GUI toolkit on MorphOS for a long time now. MorphOS 1.4.5 still included version 3.9, but now with version 4 it has been improved on all areas and you can get a whole new look for old programs too. One of the most noticeable new features is the realtime updating of the settings. You can see directly how any change in the settings will affect on the destination. The old test button method feels pretty clumsy after a while (Pic 13). 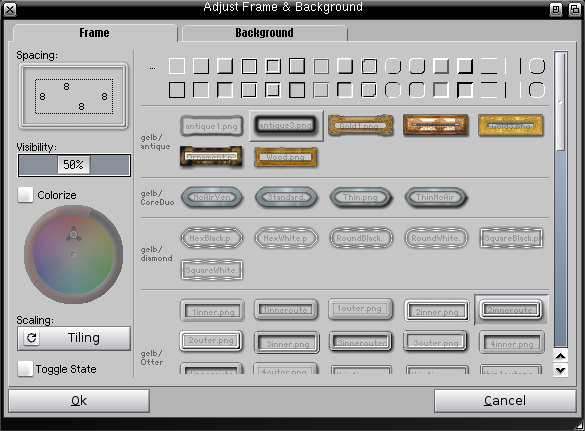 There are many new features in the background, frame and other components settings (Pic 14). They include opaque settings, improved gradients, image processing functions and premade graphic sets. You can have simple effects on the images used, like color balance adjustments or having the image in greyscale or negative. You can affect to the image positioning too. Fonts can have shadow, outline and glow effects and their colors can be changed freely. In general, configuration possibilities have become more versatile everywhere. Color handling has changed too. You can select colors with a color triangle or a color wheel, but also with RGB or HSV sliders in the traditional way. Recently used colors will be saved for later use and you can also store your favourite colors. 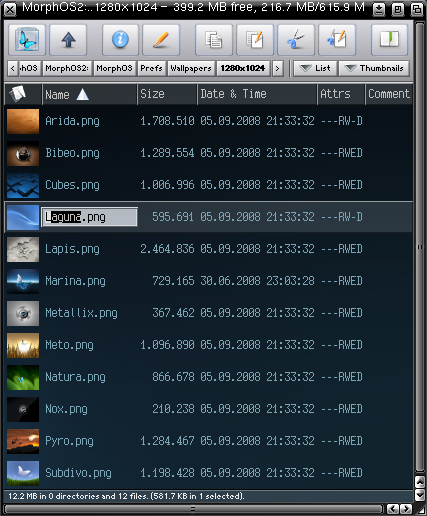 MUI4 includes a new ASL library, which affects the file and font requesters in MorphOS and in other programs. It's possible to create directories, rename and delete files, open files via Ambient before selecting them and change directory within a browsing history in the file requesters now. You can have a volume and assign list on the right side of the file requester to make navigating quicker. 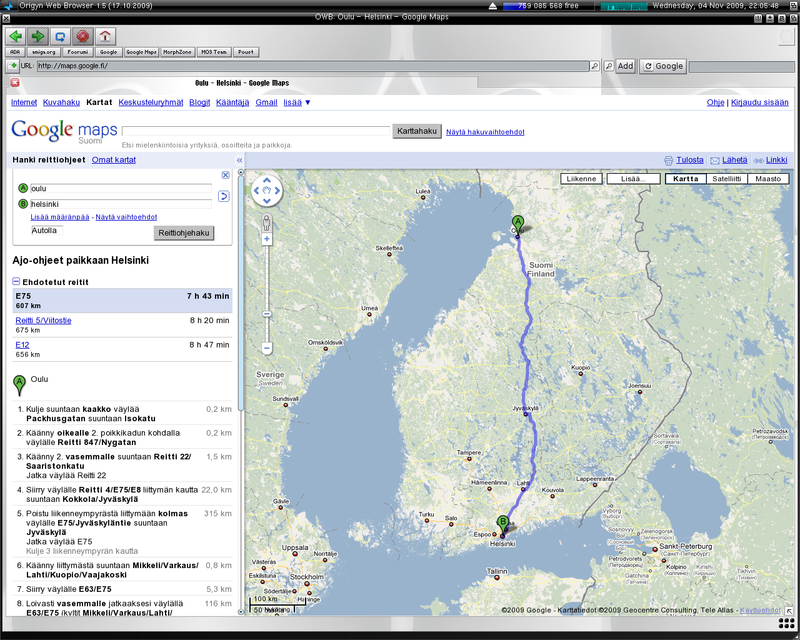 Files can also be presented with some extra information like picture dimensions and previews for the images (Pic 15). Columns in the file requester can be selected the same way as with the Ambient's list view windows. The font requester gives you a possibility to organize fonts in different groups. With one click you can view for example all fixed width, bitmap fonts or your own favourite fonts. Font list shows the available sizes for the fonts and you can select both the font and its size with just one click. 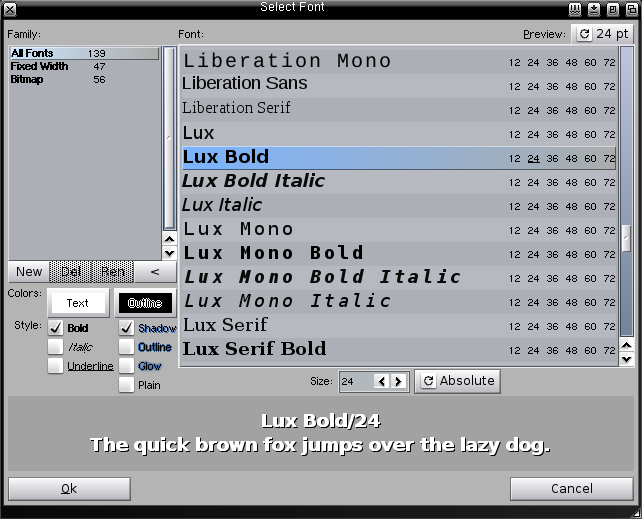 A preview mode renders each font in its own style into the list (Pic 16). MorphOS 2 has a completely new memory system. 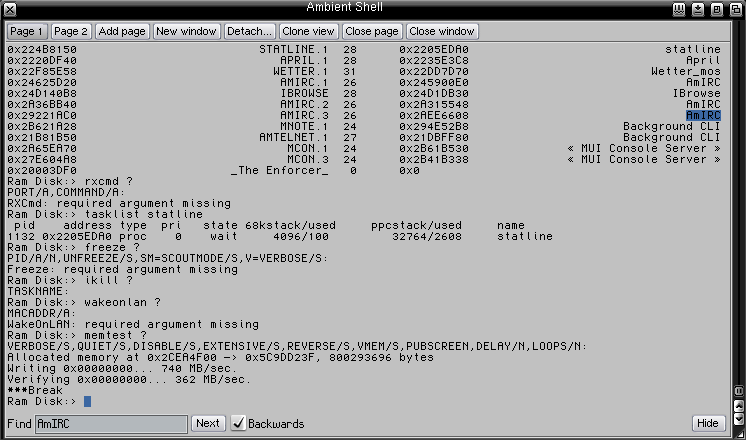 The earlier versions still used a first fit algorithm, which is familiar from the old AmigaOS. Even though it was fast for allocations, it suffered badly from memory fragmentation. The fragmentation caused visible slowdowns in longer sessions. The new memory system is based on a two-level segregated fit algorithm, which reduces memory fragmentation, but also has a constant speed for the allocations and deallocations no matter how fragmented the memory is. 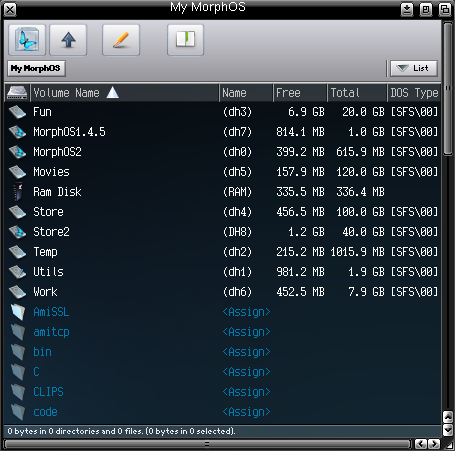 MorphOS includes a 64-bit DOS now and it allows the use of over 4GB file sizes. Big files work on Ambient and with native shell commands, but also with many old programs if the filesystem used supports it. Compatible filesystems provided currently with MorphOS are ext2, ntfs and xfs. New datatypes have been added too. For example JPEG 2000 and OpenEXR images work by default now. "Virtual" monitor driver is an interesting addition, because it makes possible to use MorphOS without any graphics board. You can use the small Efika for an embedded project and control it with VNC, for example. Already very comprehensive and versatile Poseidon USB stack is updated to a completely new version. It supports all kinds of devices from mass storage to the game controllers, PTP digicams, soundcards, network cards and fingerprint readers. And many other things. Included USB2 drivers work with PCI USB2 controllers as well as with Mac mini's USB ports. There are many improvements in the window and mouse handling. Mouse actions can be sent to the underlying window even if it's not activated. It helps a lot with volume controls etc. You don't have to activate a music player window with the left mouse button to be able to change a volume setting with the mouse wheel for example. Windows can be maximized to fullscreen by a couple of ways. The window zoom gadget can be configured to switch the window size between normal and fullscreen instead of the two traditional obscure sizes. There are many new similar options to control the windows (Pic 17). Another good example is bringing windows to front and back. It can be made normally for one window, but also for whole window families. If you have an application with many separate windows, you can send all those windows to back or front at once (Pic 18). Zoom and depth gadgets have also pop-up menus for controlling and selecting windows (Pic 19, Pic 20). MorphOS has pretty good debug features, but for a normal user the most important thing is to check the ramdebuglog occasionally. Badly behaving programs can cause unstability like on all Amiga compatible systems. You can't get rid of it without breaking the compatibility with the legacy software, but with the logs you can eliminate problematic programs and make the system more stable. In any case MorphOS seems to be the most stable Amiga compatible operating system I have ever used. 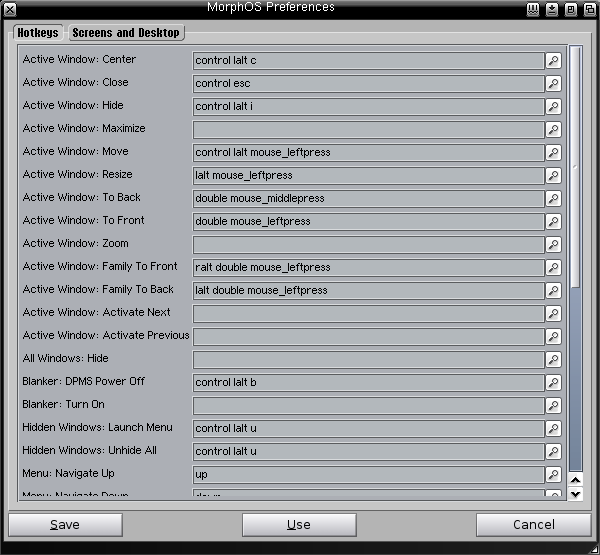 MorphOS 2 includes a good amount of different kinds of applications and utilities, which will cover the basic needs. Here is a list of the most important ones in random order. HDConfig - A completely new partitioner. 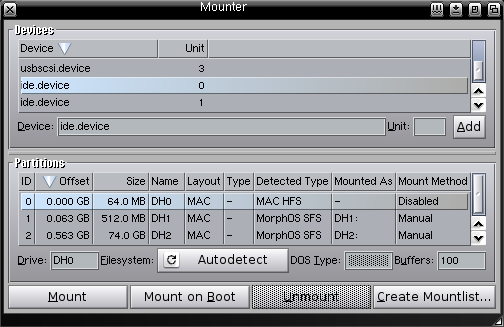 Mounter - Very useful tool for mounting and unmounting different kinds of partitions, like Linux partitions etc. SFSDoctor - To check and fix your SFS partitions. Snoopium - Shows which files and resources different programs try to use. It's based on SnoopDos. Grabber - Handy program for taking screenshots. GraphicBoards - Shows detailed information about the installed graphics boards. 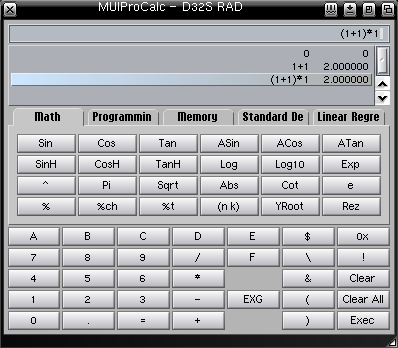 MUIProCalc - Powerful calculator especially for programmers. Multiview - A new version of the traditional viewer. It looks better and supports unicode characters etc. TaskManager - Shows CPU load of tasks and can change their priorities and send break signals. Editor - Simple text editor. Apdf - Updated version of the PDF reader. 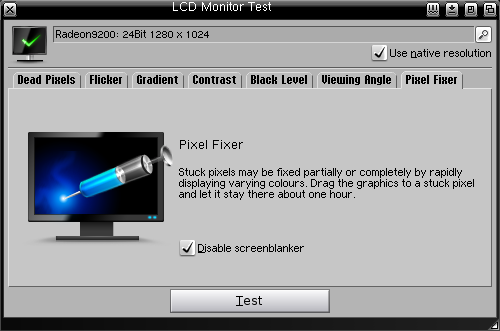 LCD Monitor Test - Capable utility for monitor testing and even repairing. RemoteShell - SSH client, which has support for ssh2 protocol. ShowGirls - Really feature rich image viewer and editor, especially good for processing digital photos. It contains many different viewing modes from thumbnails to 3D accelerated effects. It has good browsing options for image directories. Image processing functions are comprehensive and a preview for processing effects is simply ingenious. There is a line in the centre of the image and left side of it shows the preview of the effect while right side shows the original image. You can move the line around with the mouse and see how the effect would look compared to the original image if executed. Changes in effect settings will be updated to the preview image in realtime. 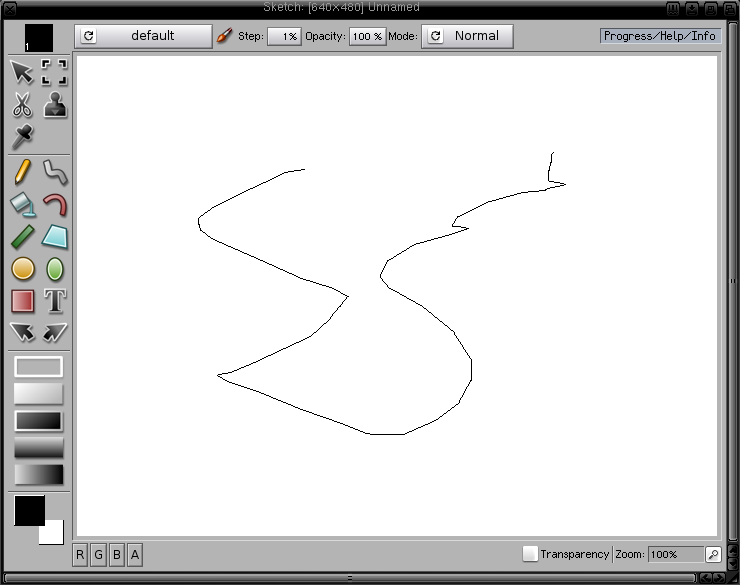 Sketch - Image processing and painting program for the basic needs. Sputnik - WebCore-based modern web browser, which is usable, but not ready yet. OWB - Modern and well-working web browser which has grown very feature rich and has become as a new defacto browser on next generation Amiga operating systems. MorphOS version is the only one having built-in media player for embedded videos too. iKill - For removing and freezing crashed programs and their resources. 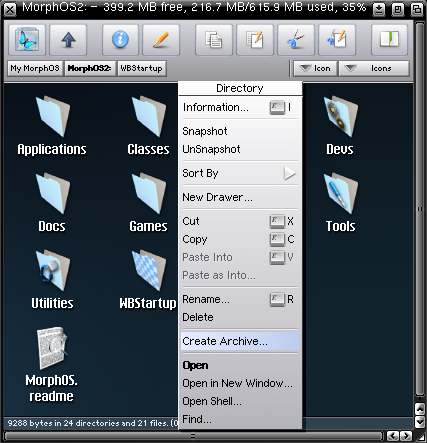 MorphOS 2 is a very comprehensive operating system package. Something you haven't seen in the Amiga world hardly ever, and probably won't see anytime soon again. It still doesn't mean it is perfect in all areas, but it stands on its own feet without any major flaws. Some components are still under constant development and everything planned isn't implemented yet, but every update makes it even better. Development has been active with regular updates since the 2.0 release. Support is good, you can get in touch with the developers directly and you usually get help and fixes quickly. And the speed then? It is fast, really fast. It's something that mainstream users won't believe until they see it. Actual operating system boot time is only some seconds and everything opens and closes without delays (Video 6). All in all, if you want to continue your Amiga hobby, and take it into whole new levels, MorphOS 2 is well worth the price and will give you fun for years again! It has also become complete enough to be a nice option for people looking for new alternative platforms, even if they don't have any Amiga background. Video 6. Booting, OWB, MPlayer, Showgirls etc. 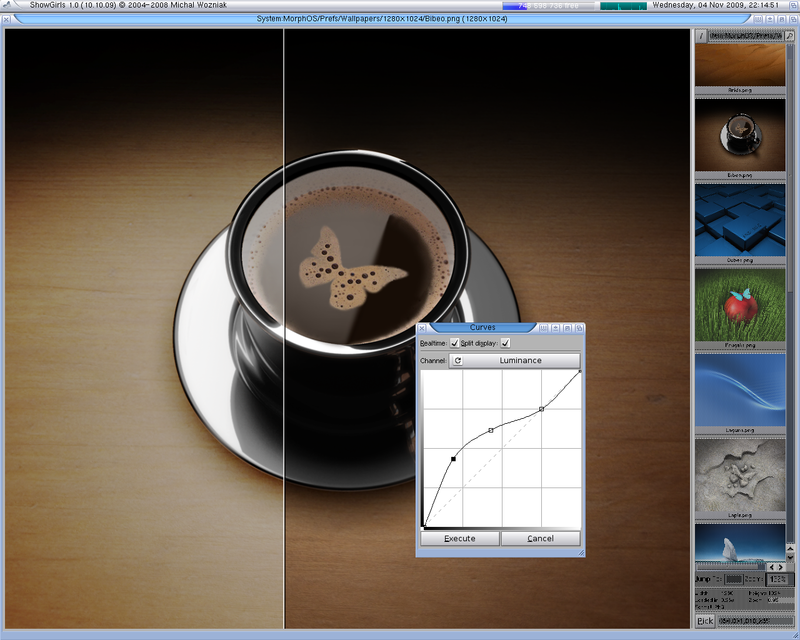 MorphOS 3.0 is going to be released in 2012 and it will have support for 1.67GHz PowerBook G4 notebooks! Update will be free of charge for 2.x users. Read more about the new version in my "What's New in MorphOS 3" article. To disable the annoying startup sound, remember to mute the volume from the OSX side before going for MorphOS. It won't come back even if you wipe the OSX and turn off the power. Or if you want to use dualboot system, you can install StartupSound.prefPane for OSX. To make the alt-menu faster for dual-boot setups go to the OF and type "setenv skip-netboot? true". If mouse or window movement isn't smooth or you get gfx distortion, you've run out of graphics memory. To reduce gfx mem usage you can use less screen buffers for enhanced displays (DisplayEngine prefs), disable enhanced mode completely for some screens (Screens prefs) or even use smaller color depths for screens (Screens prefs). DisplayEngine settings take effect when you switch screens. No need to reboot when finding suitable settings with Mac mini with only 32M graphics mem. To force a CD to eject, reboot with the left mouse button pressed. To force the computer off, hold down the power button.